Another one of our wonderful models from the Carbon County Environmental Education Center. I've heard Screech Owls in the woods behind our house but never imagined how small they are! That seems a rather malevolent stare! Glad I'm not in his sights!! Excellent photo! I love his name. Ha! Those eyes look so serious. Nice capture. Wow - what an excellent image of a fabulous bird. 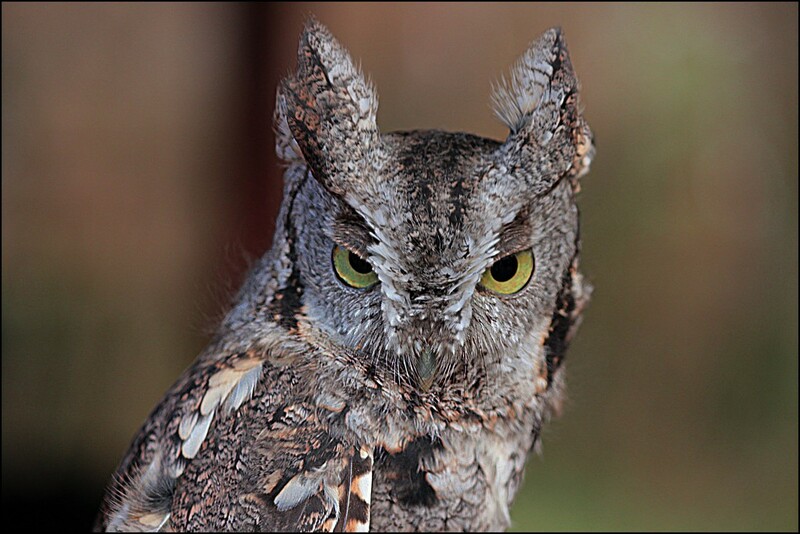 Great close up of this beautiful owl head. Thank you Taffy, Dawn, Milanie, Jolene, CC, Joan, Denise, Babs, Lou Ann, Lynda, Henri, Marilyn, Katy, Claude, Joanna, Rob, and Ferry! And Otis thanks you too. He was quite pleased to see he landed on both the TP and PP! Don't let his intense stare fool you. He was very happy to pose. He was extremely tolerant of 15 or so photographers all vying to get a good shot of him! @randystreat Thank you Kathy and thank you for the fav! @4rky Otis and Rhet were on perches on picnic tables- easy breezy! The handlers presented the larger birds for us and were so good at finding great back grounds and poses. We weren't more than 3-5 feet away from any of them that morning. @kjarn Thanks Kathy! He was a real ham!